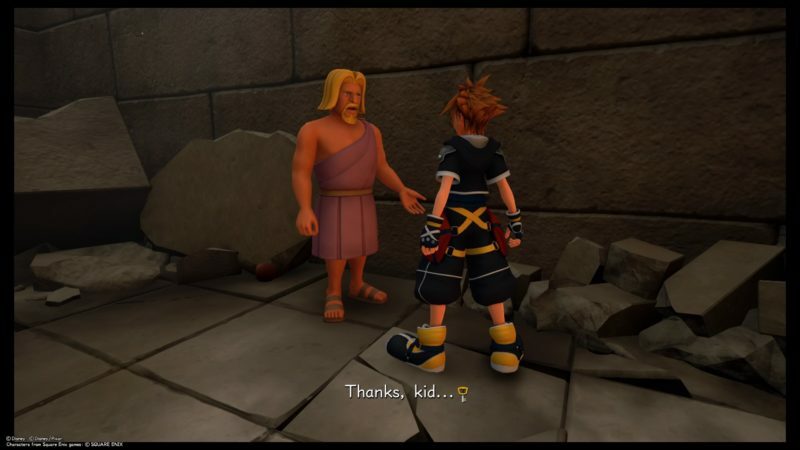 The story of Kingdom Hearts 3 (or 2.9) begins in Olympus. 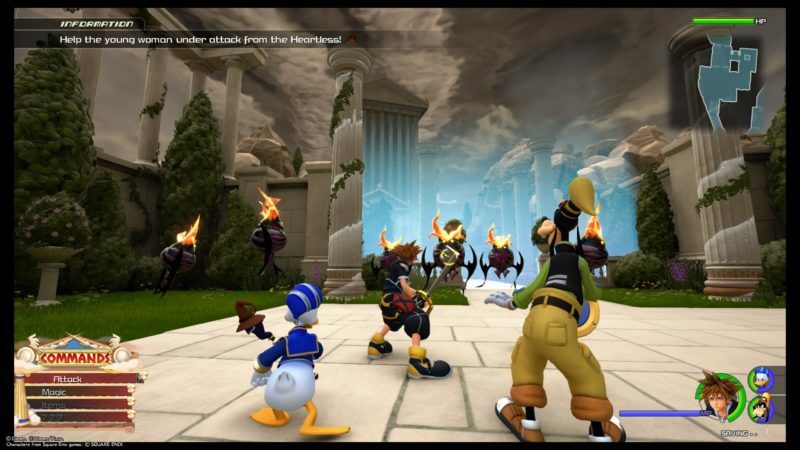 Sora, Goofy and Donald Duck goes to look for Hercules, as the latter may help Sora get his powers back. Apparently Hercules regained his strength after losing it, and perhaps he may know the way to get it back. 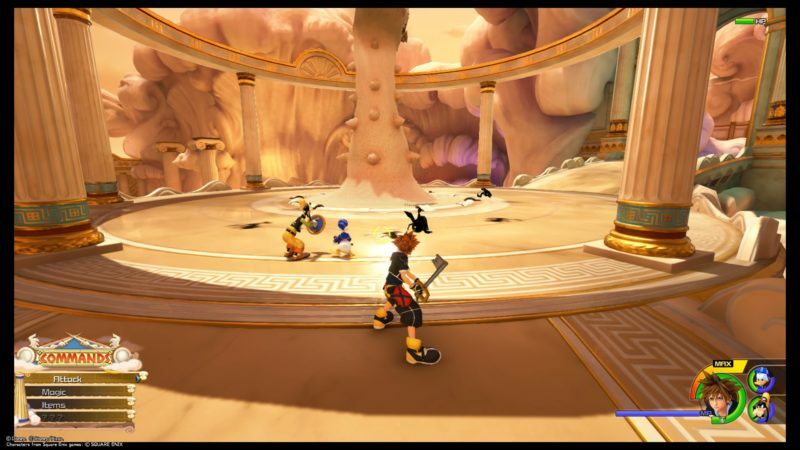 Here’s a walkthrough and guide of Thebes and Olympus in Kingdom Hearts 3. 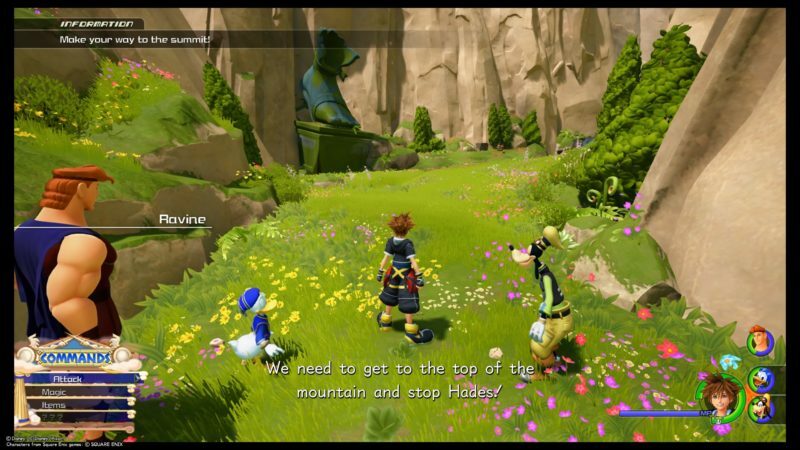 For the purposes of making it shorter, the portion of Sora and friends on the way to Thebes have been omitted. They are quite easy anyways. 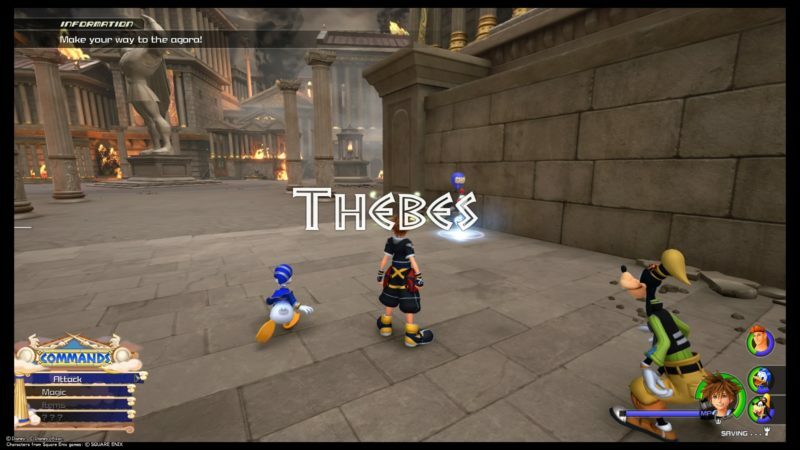 Upon reaching Thebes, you can start saving your game. You can also buy items from the moogle shop. At the moment, you may not have enough munny to buy items, but this pop up store appears elsewhere too. 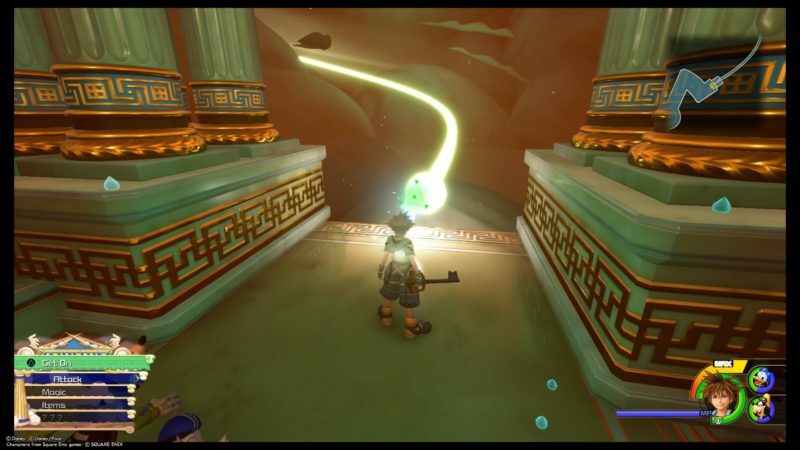 Do remember to go around each area on the map, as there are treasure chests scattered all over. 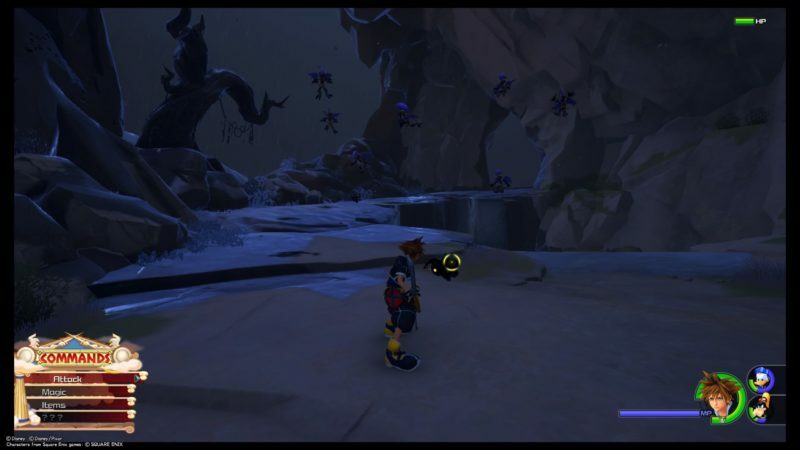 The first thing you have to do is go forward and a cutscene will start. 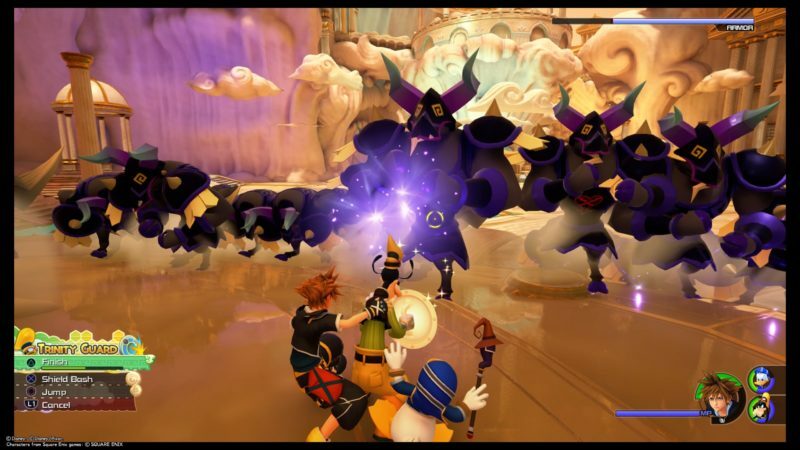 Defeat the Heartless that spawns. 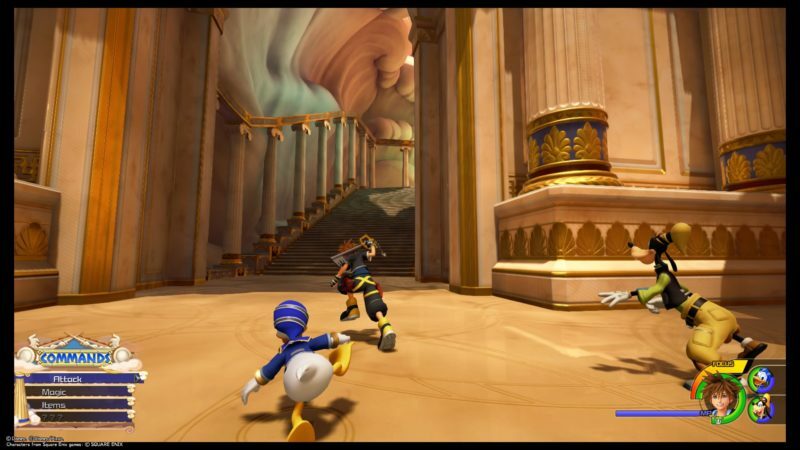 You should even be taught how to perform some of the moves, like going round the pillar and attacking the Heartless. 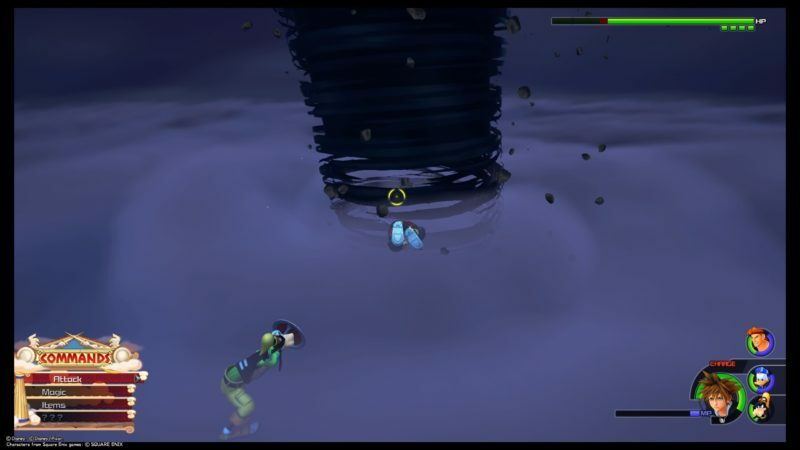 After defeating them, Meg arrives and later leaves elsewhere. 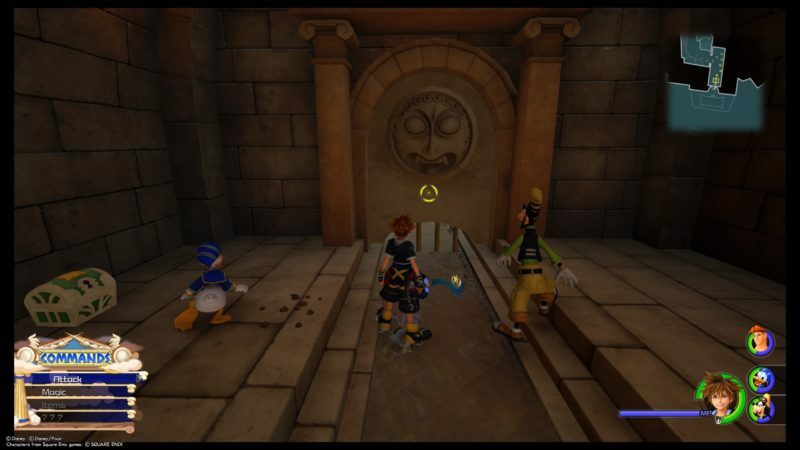 Goofy then hears a call for help and Hercules will throw you guys to the area using his statue. The girl will be rescued. 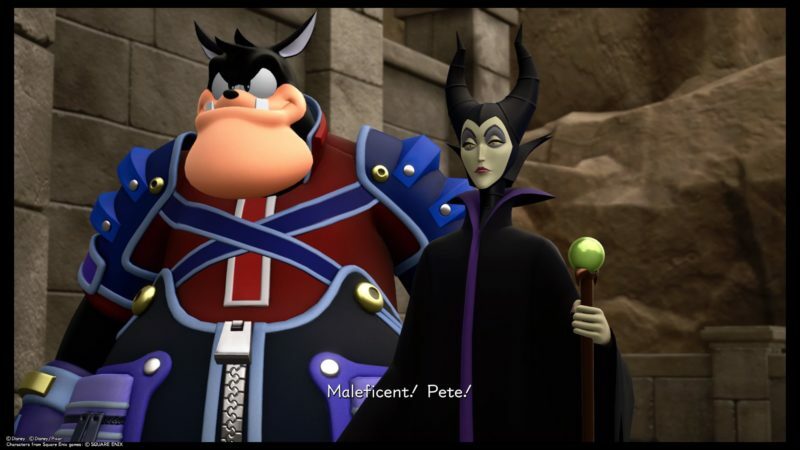 Maleficent and Pete appears, looking for a black box. They will leave after some chatter. 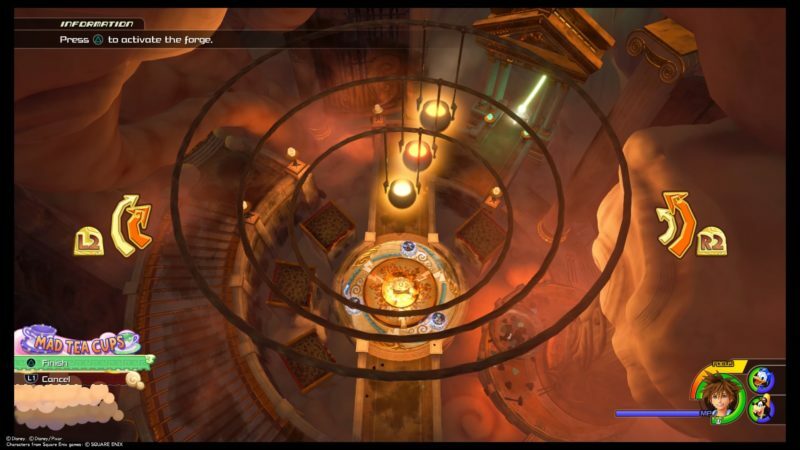 If you look nearby, you should gain the map to Thebes. The map appears as a radar on your screen. 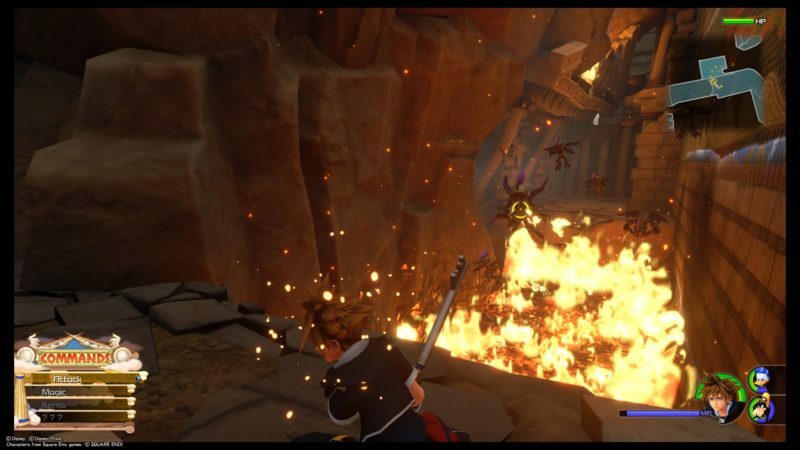 You’ll need to take out more Heartless as well. You will then reach a place where there is fire all around. 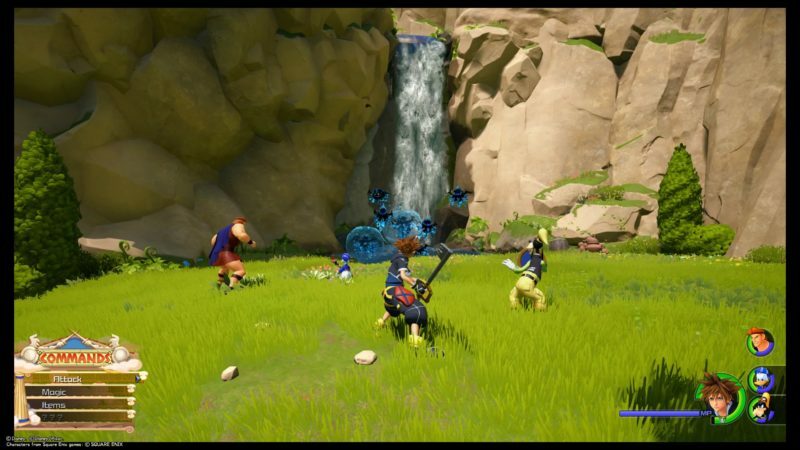 Goofy will suggest using his shield to slide through. It will be a normal feature hereon. 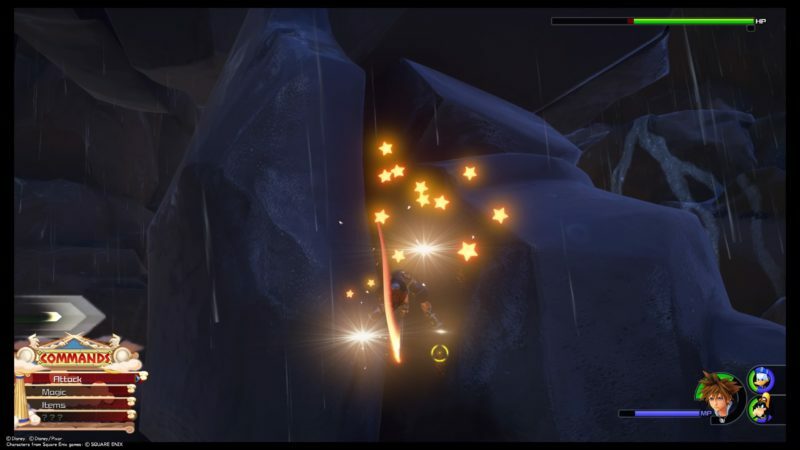 While sliding, you just have to navigate through the fire. 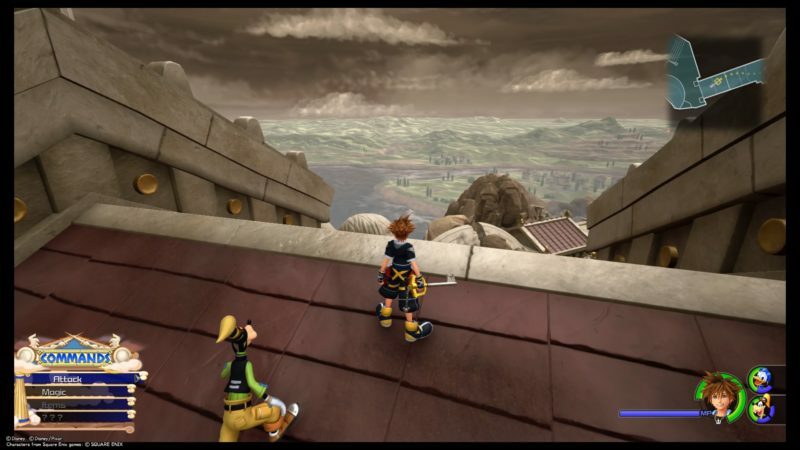 Next, you should get to the rooftop with this awesome view. 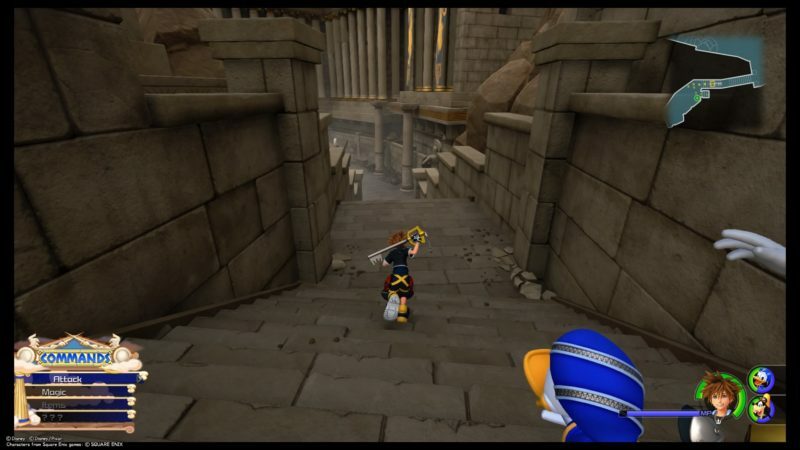 Jump down and you’ll find more Heartless. Get rid of them and talk to the NPC. 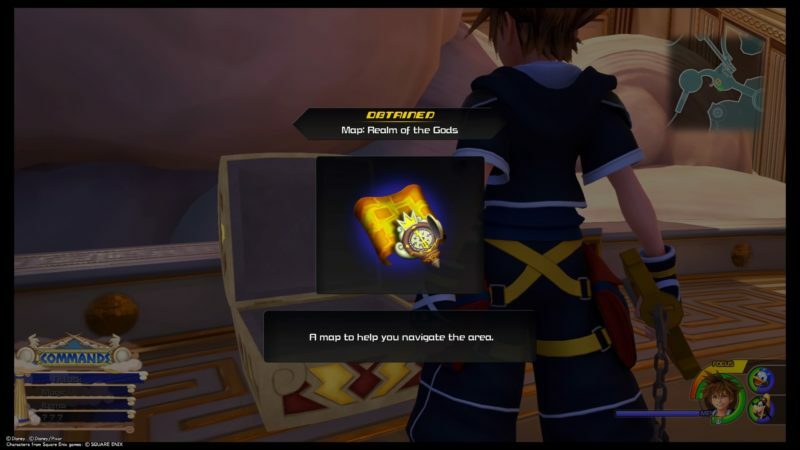 You will normally get a potion or some health item for saving them. 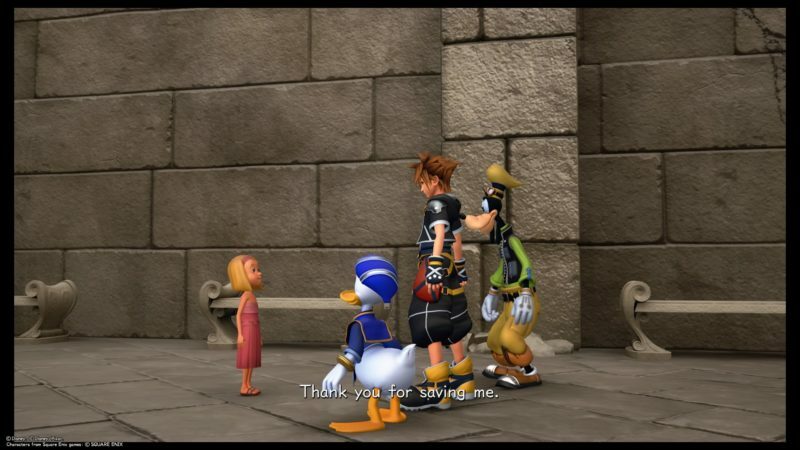 Remember to talk to each NPC after rescuing them. 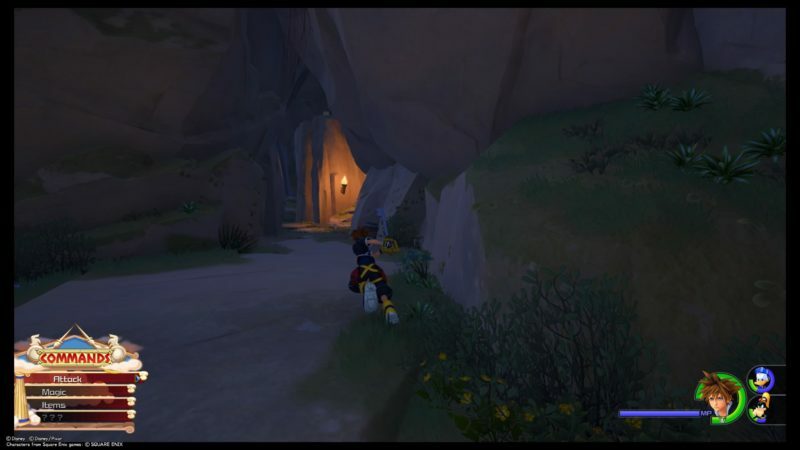 You’ll need to use the shield again to get to another area. Make a turn into an isolated place. You should find more Heartless here and a person to rescue. Now, get to this garden area. There’s a lady on the pillar. 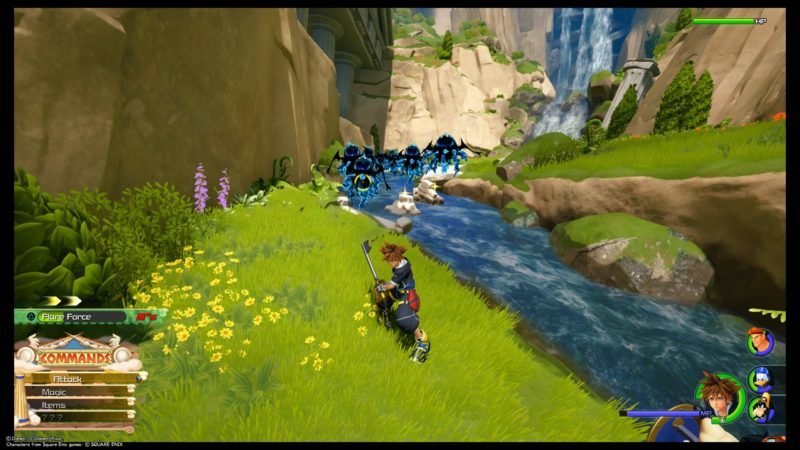 Defeat the Heartless here. 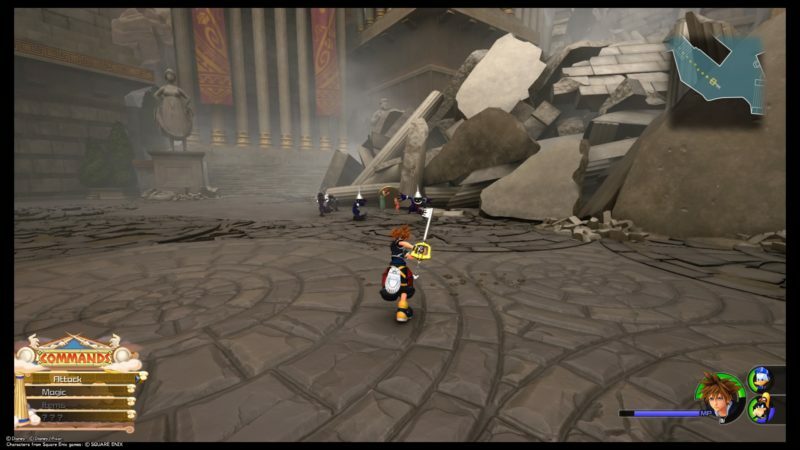 If you get to the side, you can actually destroy the pillar and the pillar causes the wall to crumble. Now, get to this area. 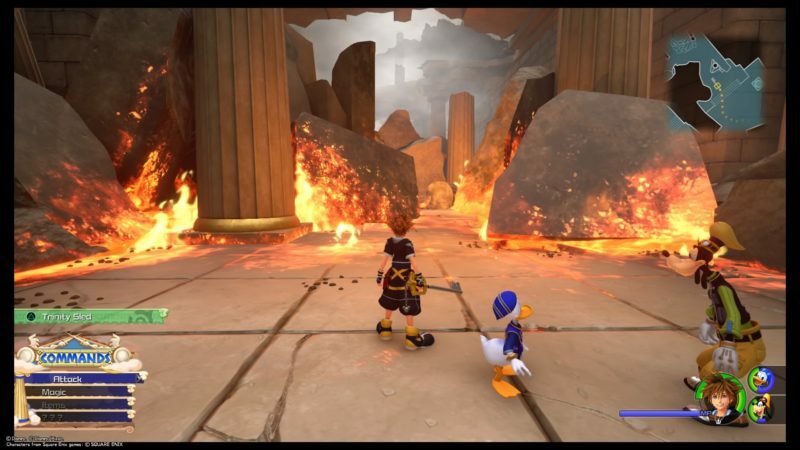 You will have to walk on the wall to cross the fiery area. 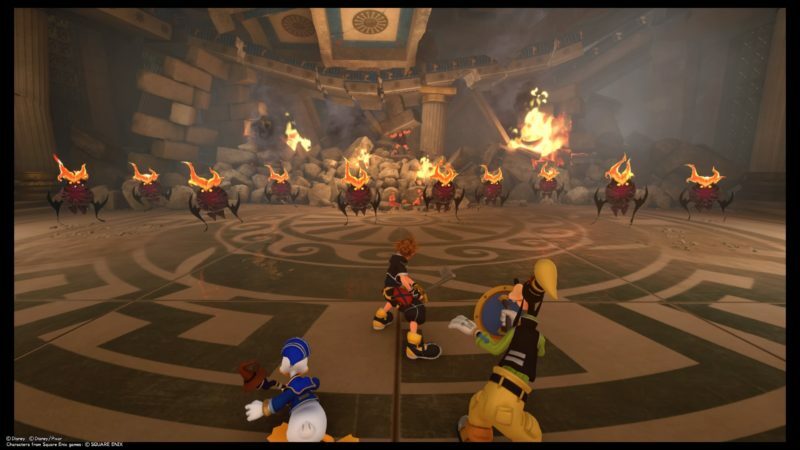 There will be two types of Heartless here. Keep going and you’ll reach this place. Another human is found here. 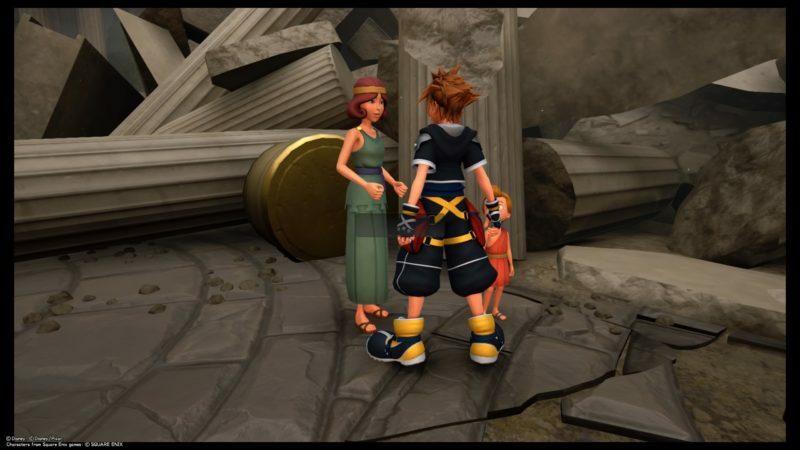 Defeat the Heartless and talk to this lady. 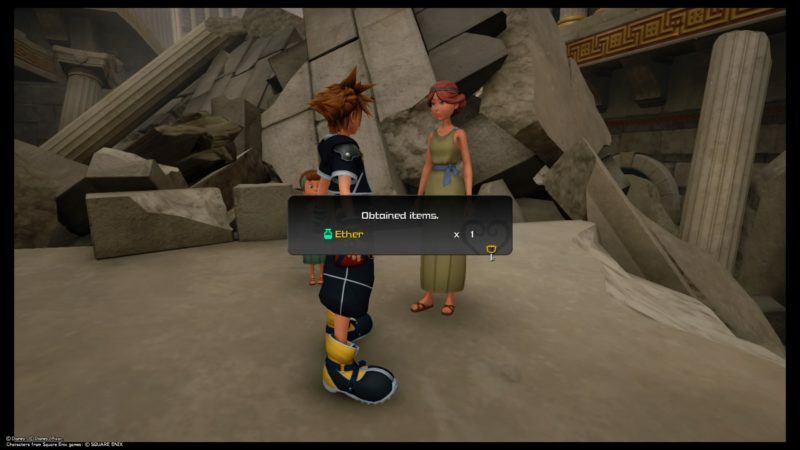 You will get an Ether for rescuing her. Next, you’ll see this place with rocks on fire. 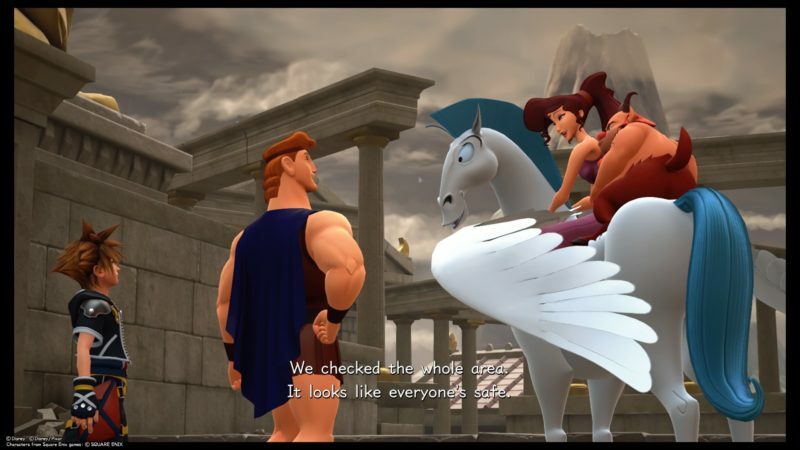 Walk through it and you’ll be meeting Hercules again soon. 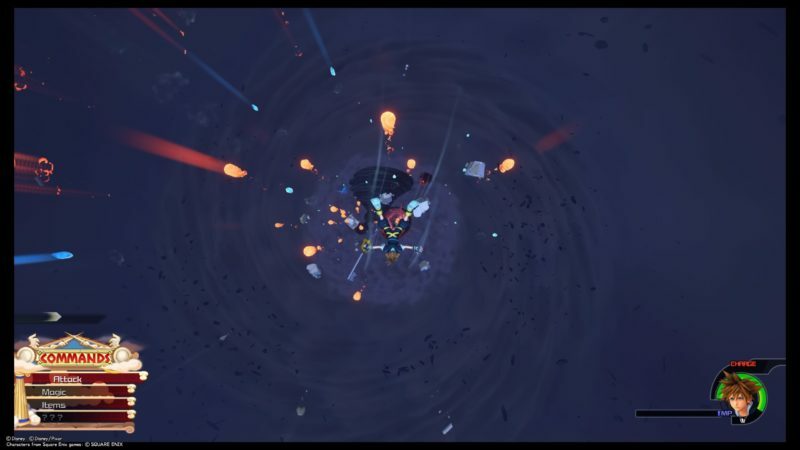 Before that, there’ll be more Heartless on the way. 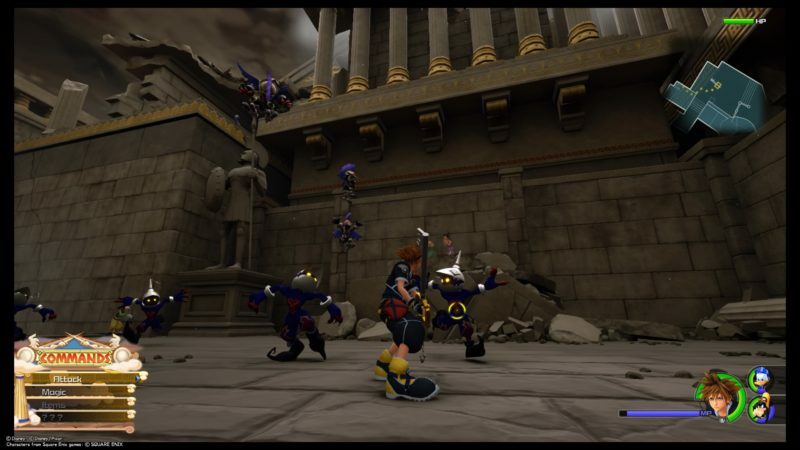 You will finally find Hercules inside a building, surrounded by more Heartless. 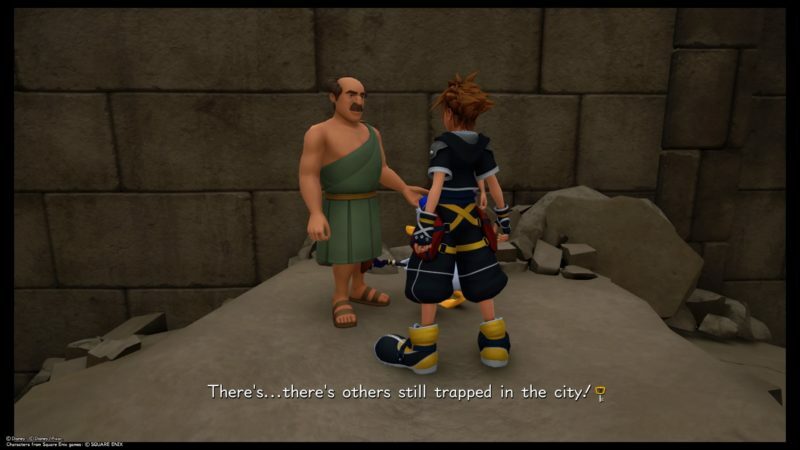 He is sustaining the weight of the building and you have limited time to defeat the Heartless and save the people. 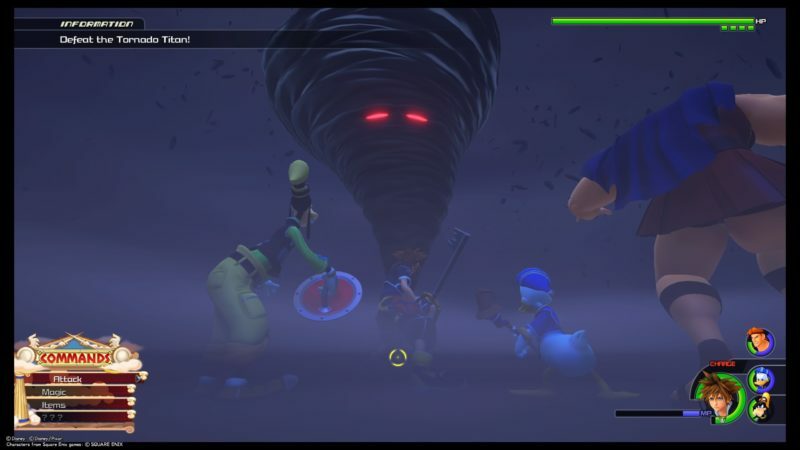 There’ll be waves of Heartless, so you do have to rush this part. Personally, it took me 2 minutes 30 seconds, so it was a pretty close call. 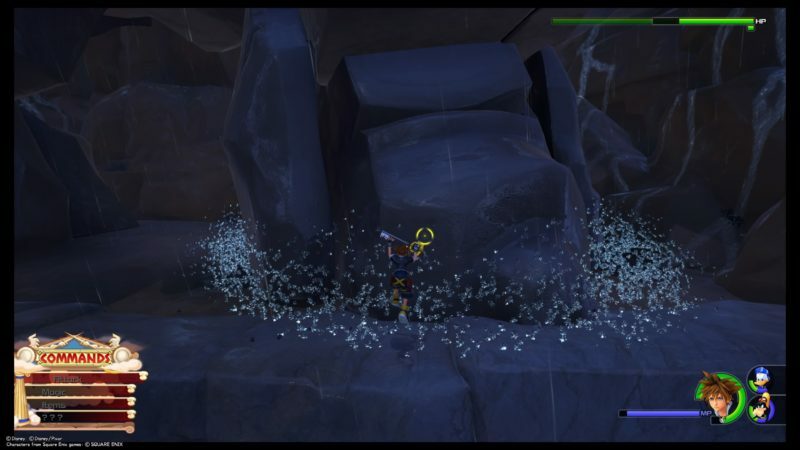 The game should also teach you how to activate the second level of your keyblade once you’ve accumulated the hits. 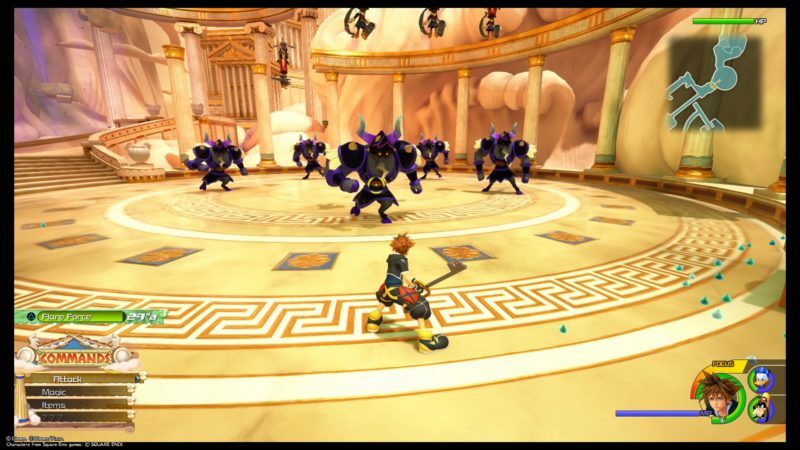 After beating the Heartless in time, you guys will all leave the building and Hercules stays back. 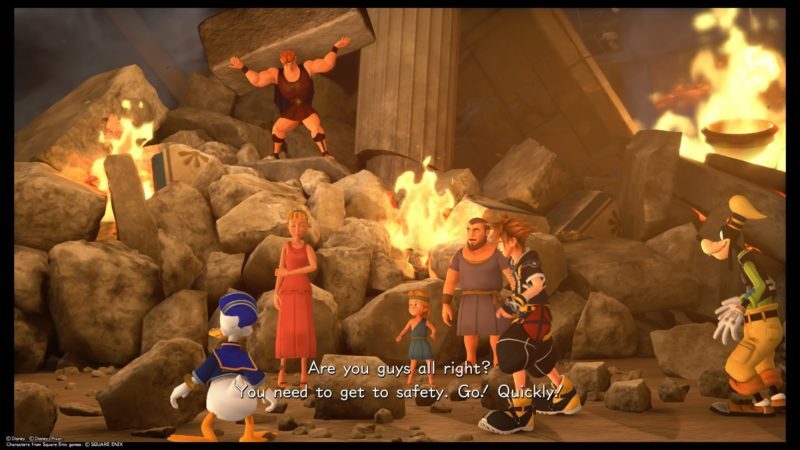 During the cutscene, the building dropped on Hercules but he survived. 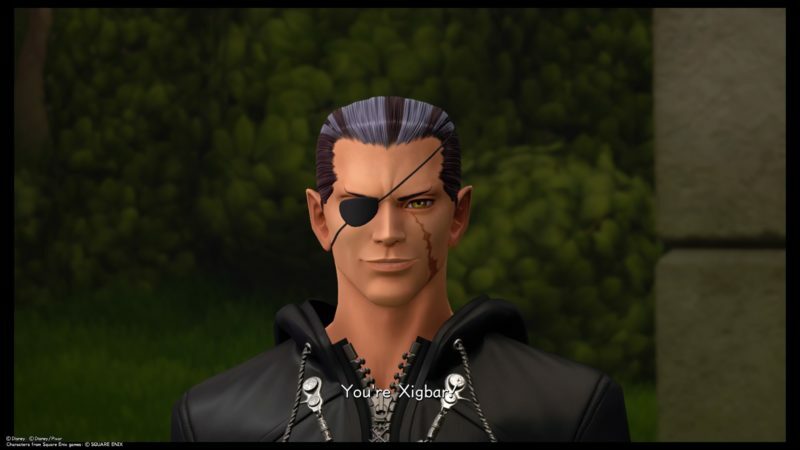 Xigbar appears to tease Sora and the rest, but leaves thereafter. Keep moving on and you should reach this gate. Destroy it by attacking. There’s a chest beside it. 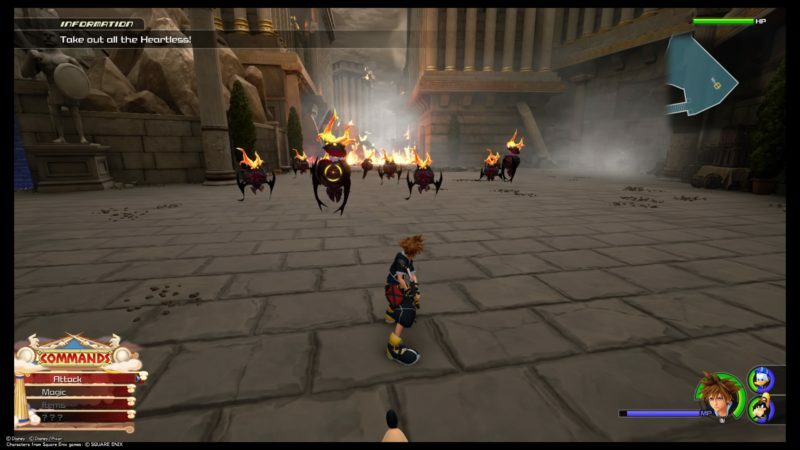 As you get back to the city, you will meet more Heartless. Defeat this big guy and the smaller minions. 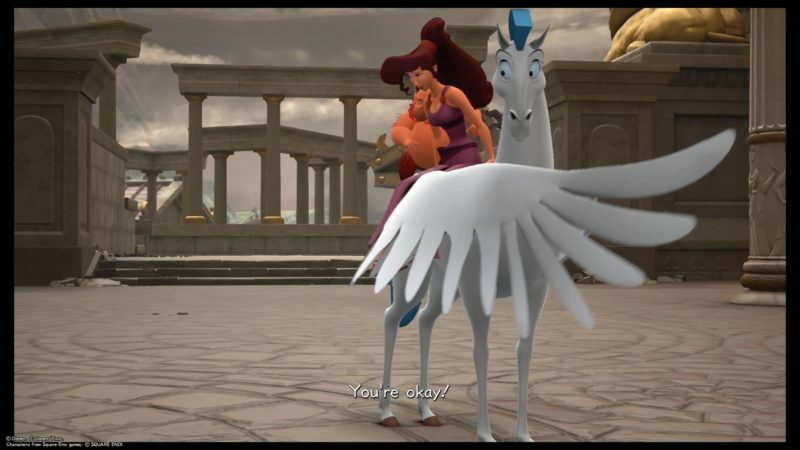 A cutscene appears, and Meg comes back. Apparently everyone has been saved. Black clouds then surrounds Mount Olympus. Follow Hercules to Olympus. You can save the game and buy more potions at the shop prior to doing so. 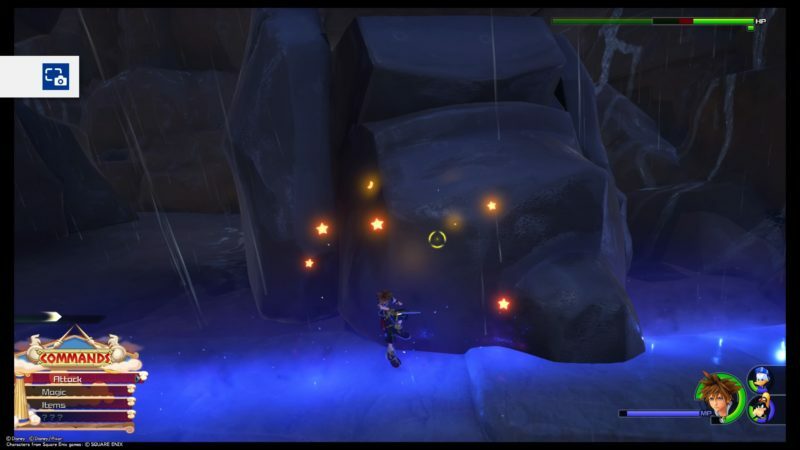 Once you go ahead, you will be teleported to the next area, which is the way up the mountain. 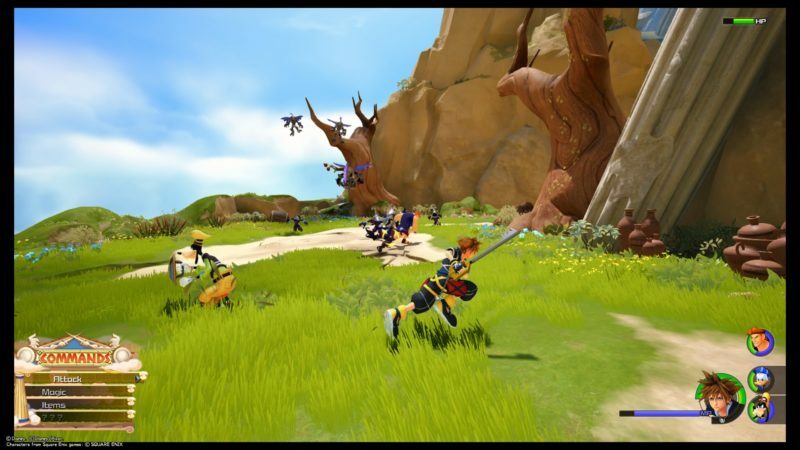 There’ll be plenty of Heartless here as well. From now onwards, you need to keep finding the way up. Some walls can be climbed as well. 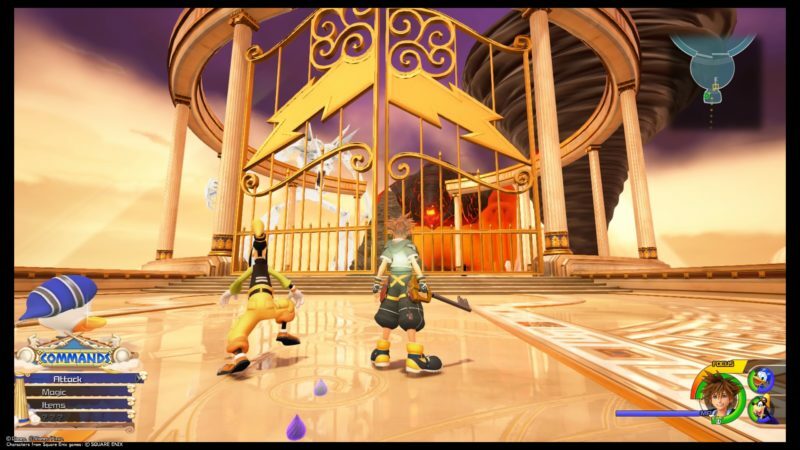 You will know as it is highlighted in the game. 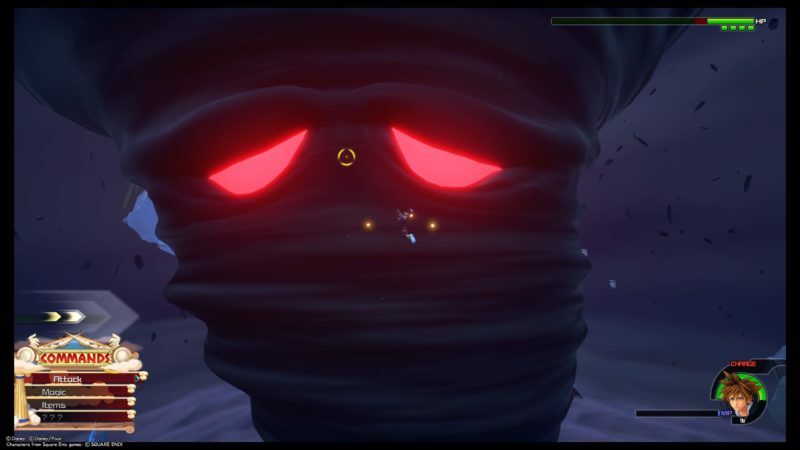 You will reach this place where there are more Heartless and even a sand monster. Just keep fighting as usual. Team attacks are pretty effective here. Hercules will leave you guys and he’ll get to the top by himself. 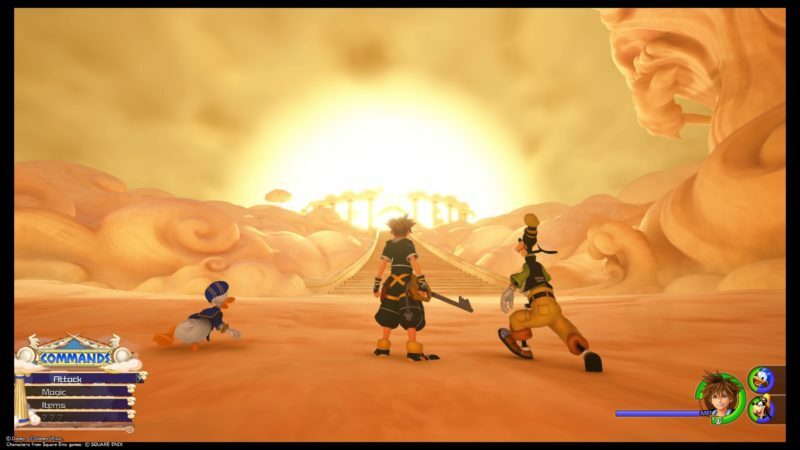 Keep going further with Donald and Goofy. The rock titan will keep throwing rocks down your way. Avoid it while going up. Get to this entrance here. 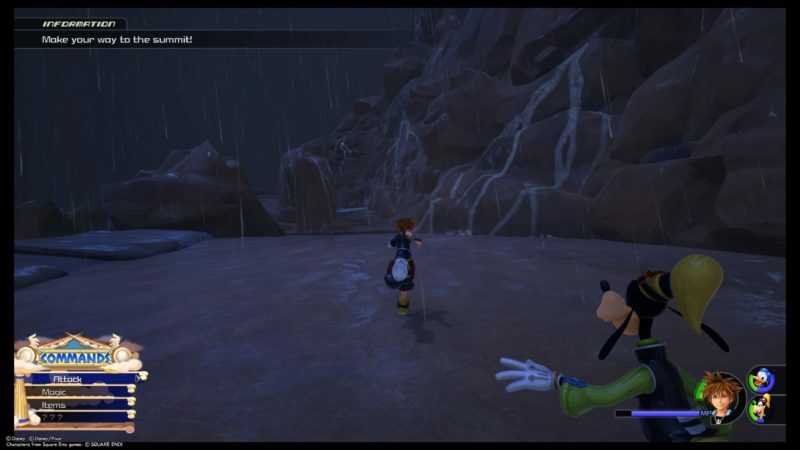 You will meet more Heartless inside. Continue your journey up the wall. 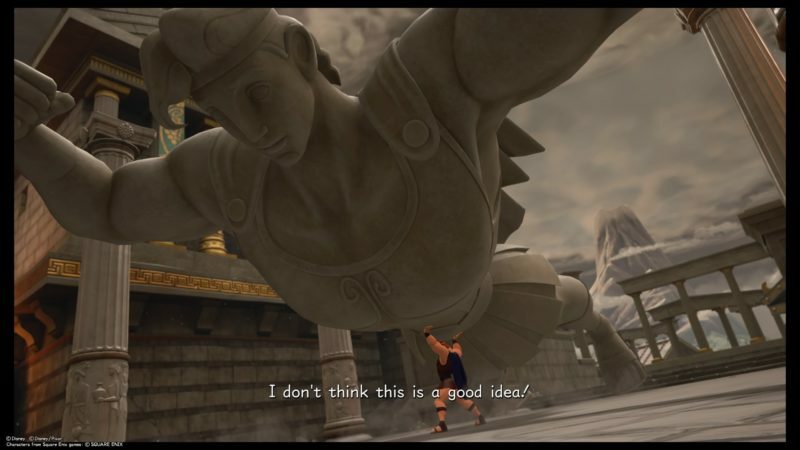 This time, you have to beat the Rock Titan. In the beginning, you can only target his legs. Destroy each leg until you see lava marks on it. You need to immobilize both of his legs. Once you do that, you can start attacking the head. 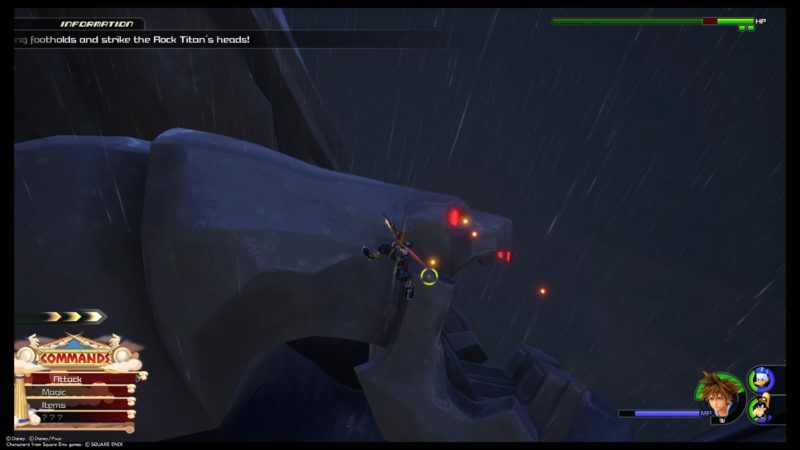 Climb up the titan using the glittering marks on his body. After sometime, his legs will be back to normal. You need to repeat the same process. Destroy the two legs, and eventually the head. To avoid huge damage, try to run away when he raises one of the legs, as it causes a mini earthquake when he stomps the ground. The fight is over once you’ve defeated the head the second time. 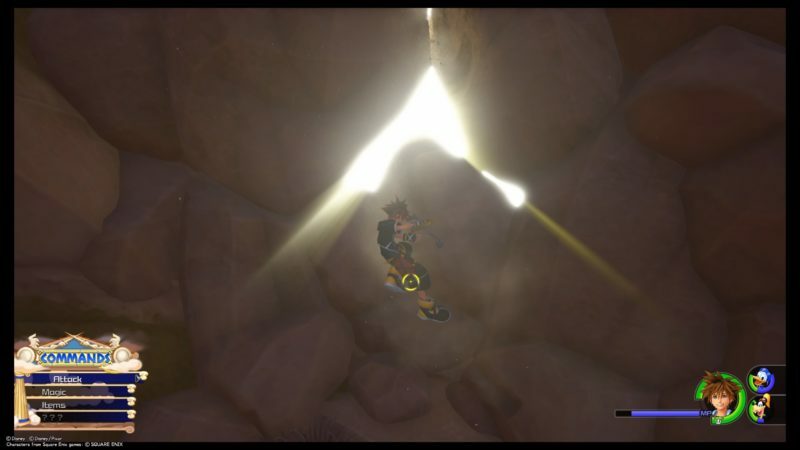 Keep going until you find this crack on the wall. 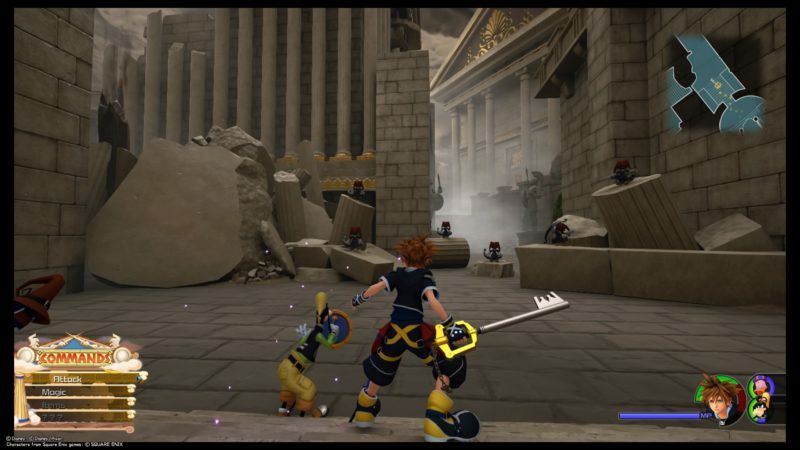 Destroy it using your keyblade. You will eventually reach the stairs to Olympus. 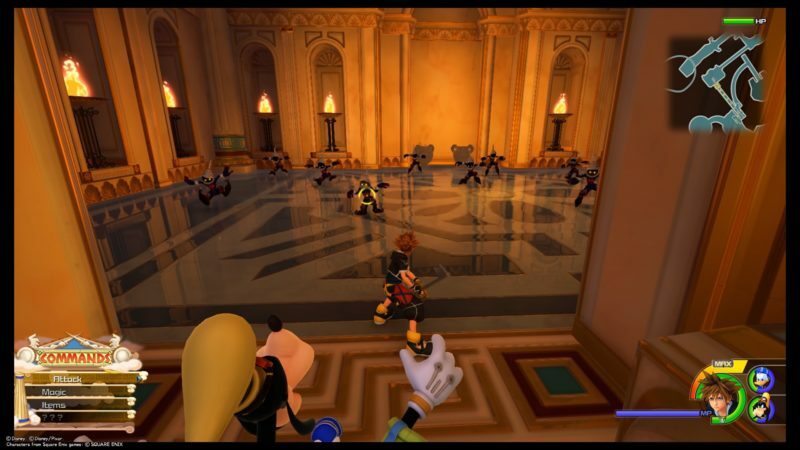 As you enter the place, you will notice plenty of Heartless bulls. 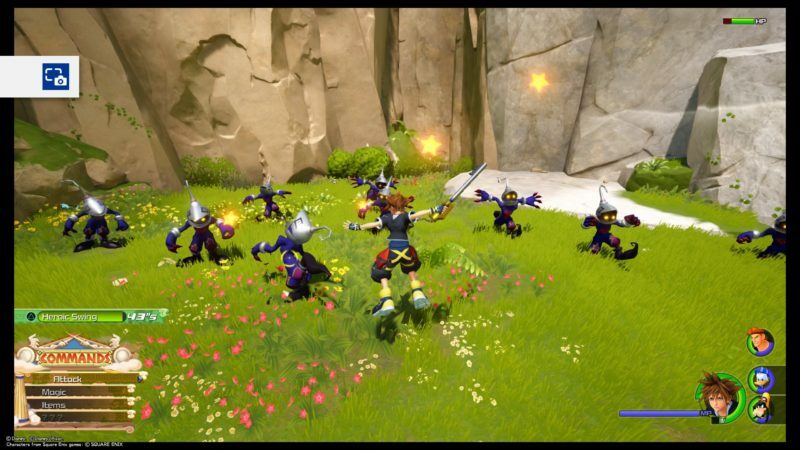 They attack in a herd and you need to be quick to dodge their charging attack. Try to defeat as many as you can in the beginning to make them much less of a threat. They are pretty weak defensively. Use all kinds of team attacks at your disposal, like this Trinity Guard in the image below. Once you’re done, head upstairs. 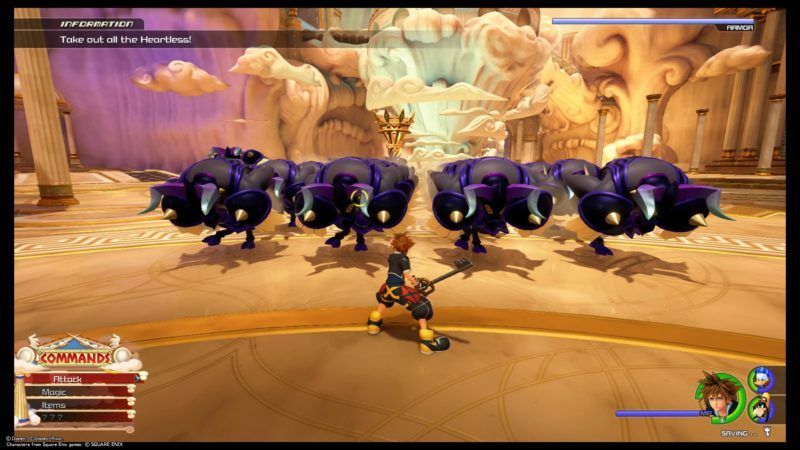 Defeat even more Heartless. 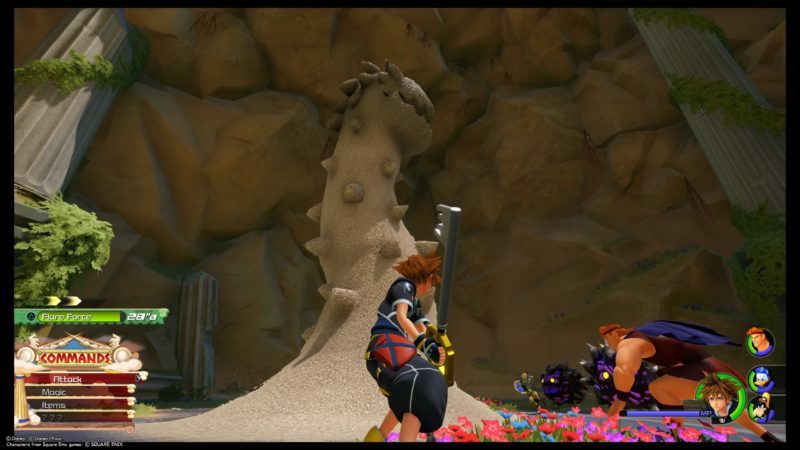 This sand monster is back. 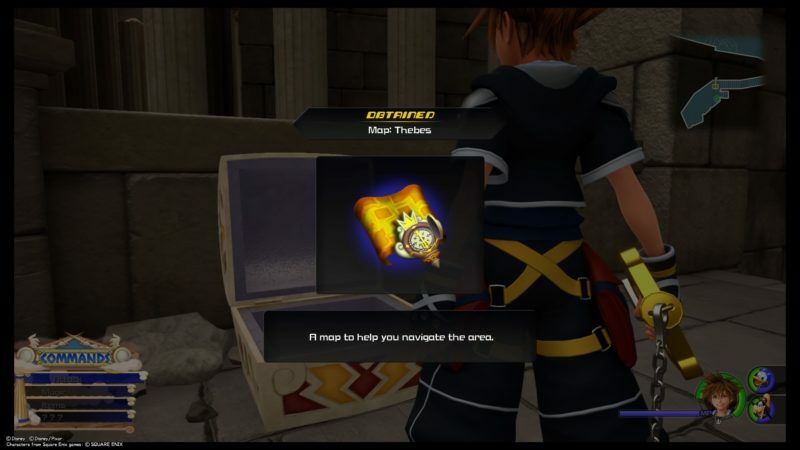 After getting rid of them, go ahead and you’ll find this chest. It’s a map of the place (Realm of the Gods). 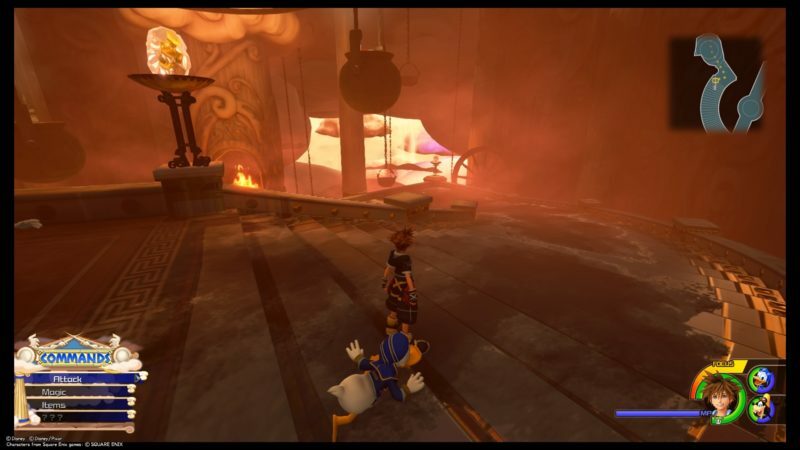 After beating the Heartless, you may need to jump down. 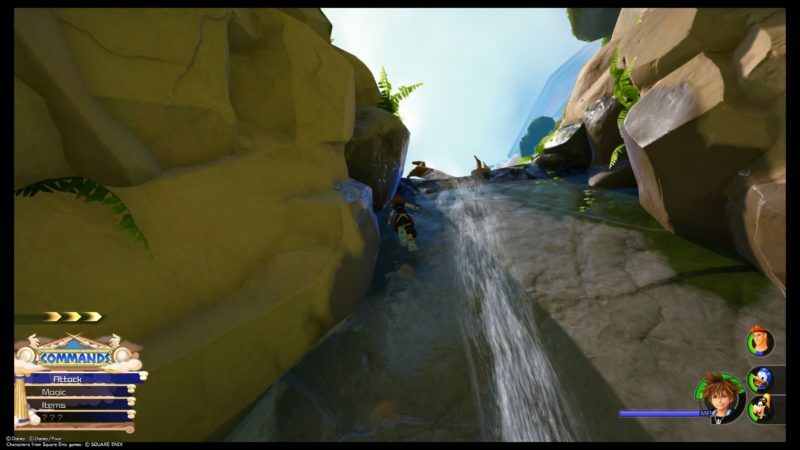 You will reach this area called the Forge if you jump down from above. The mission is to align all of the pots together. If you hold R2, two rows of pots will move, and L2 only moves one pot counter-clockwise if not mistaken. How it works is that all pots move in a different speed. Keep trying until you get them aligned. They should be aligned like in the image below. Once it glows up, activate the forge. 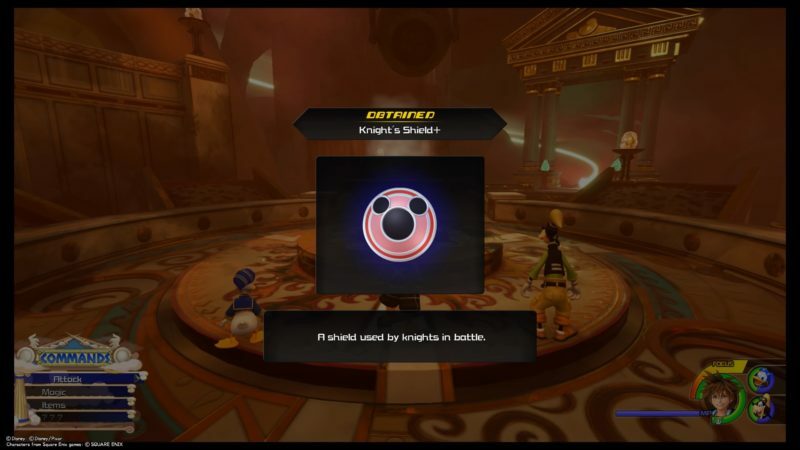 You will then earn a Knight’s Shield +. 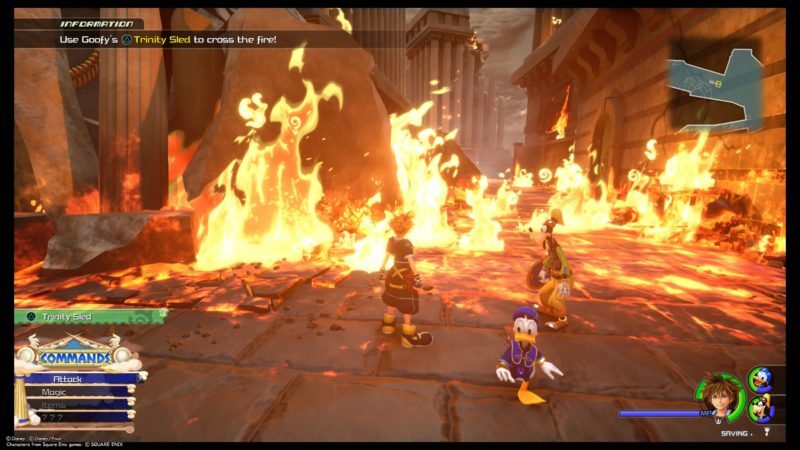 This one can be used by Goofy, and it introduces additional fire resistance stats. 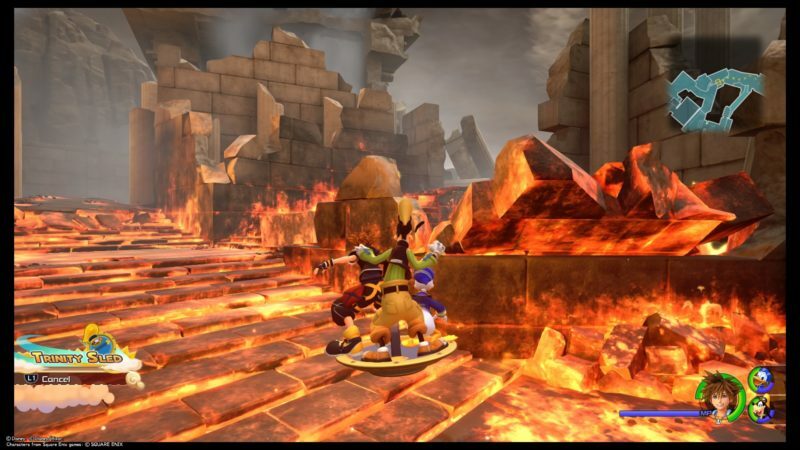 At the moment, Goofy should be using the same shield, but without the fire resistance bonus. 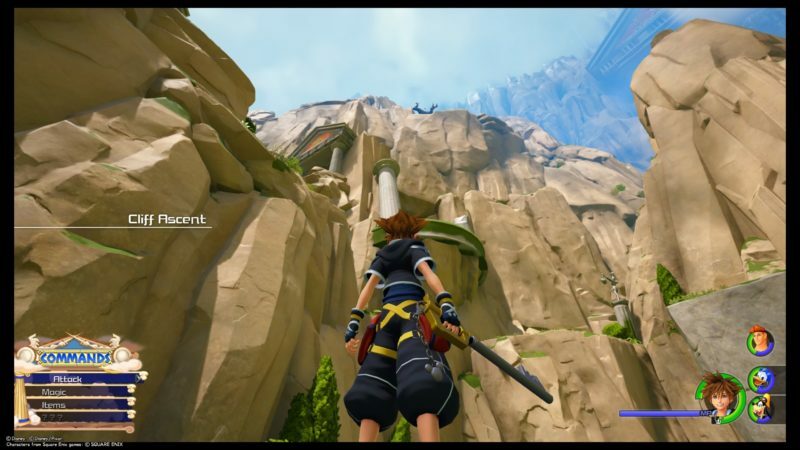 Kingdom Hearts 3 will also introduce this sliding feature to you. Read the tips when it appears. 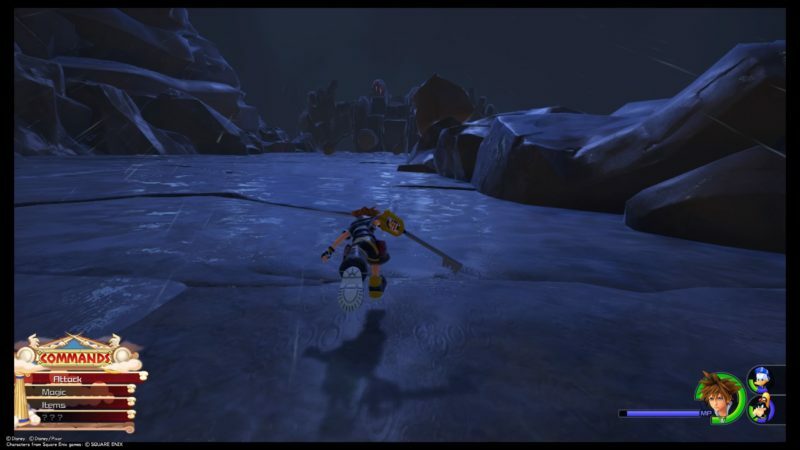 It will bring you back up, and you will meet even more Heartless here. 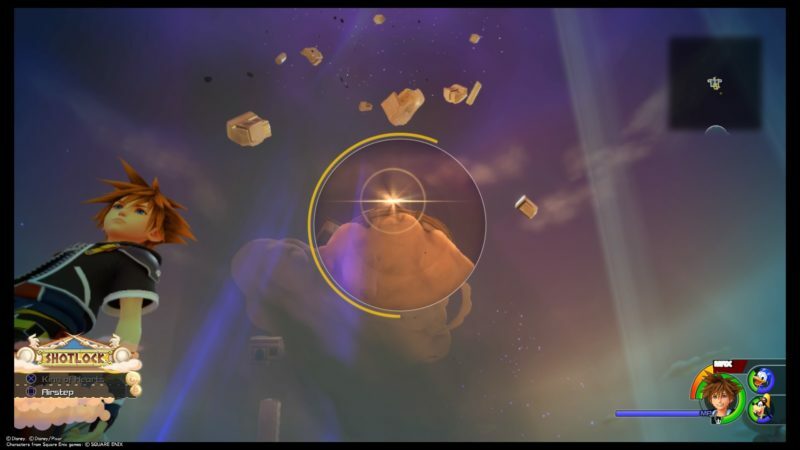 Next, you will reach an area where you can only get to the top if you use the floating stones. 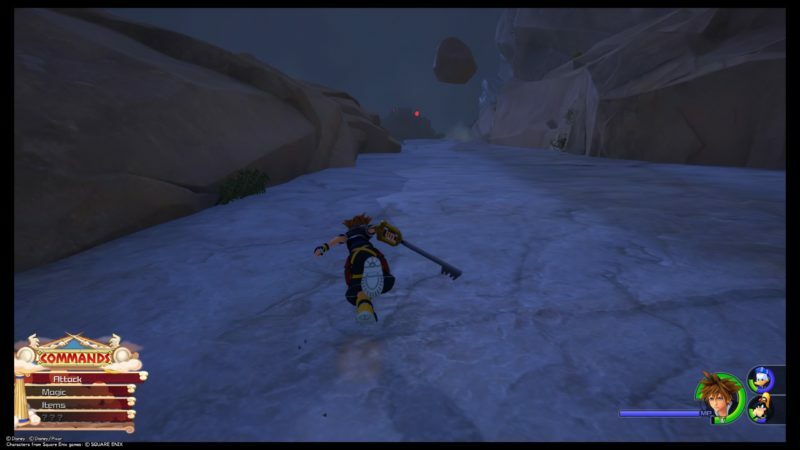 Practise your shotlock by holding R1 on a target and pressing “Square” to jump. This is where I was confused. 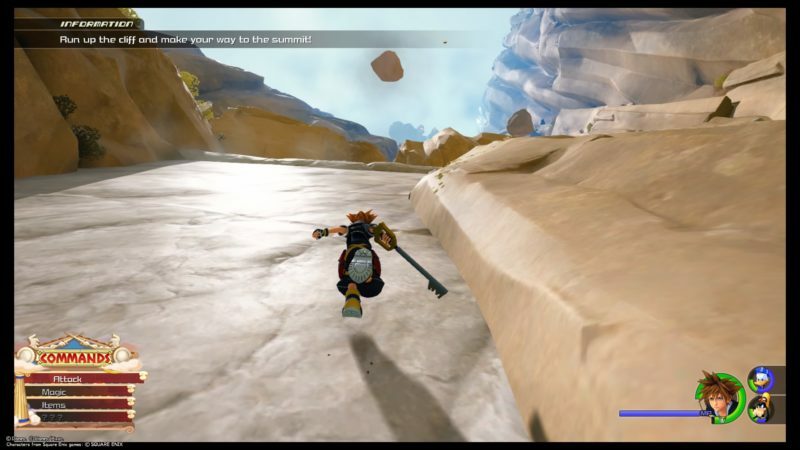 You don’t actually need to target individual stones to jump. 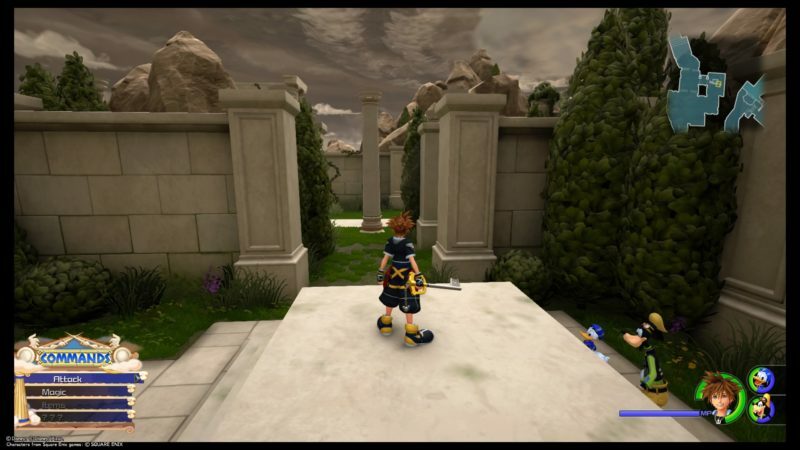 Just target the top of the building and Sora will automatically jump on the requisite stones. On your first landing, you should see this huge box. You probably can’t break it open with your weapon. To open it, you need to shotlock yourself first to the next highest platform. 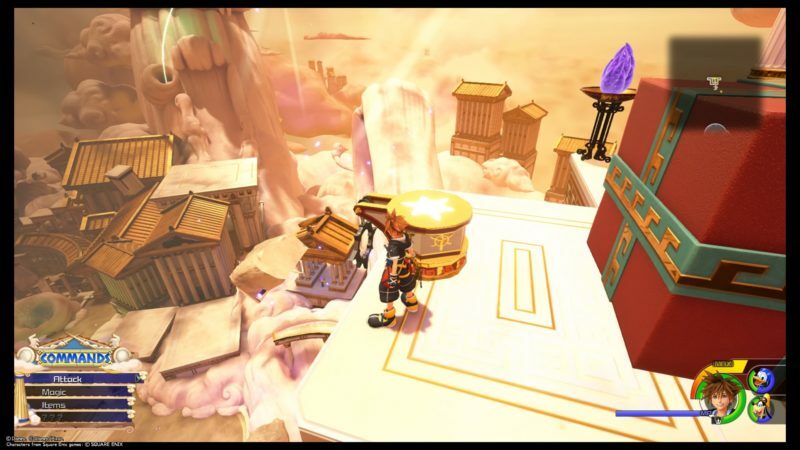 Jump from there and press attack on the way down to break the box. 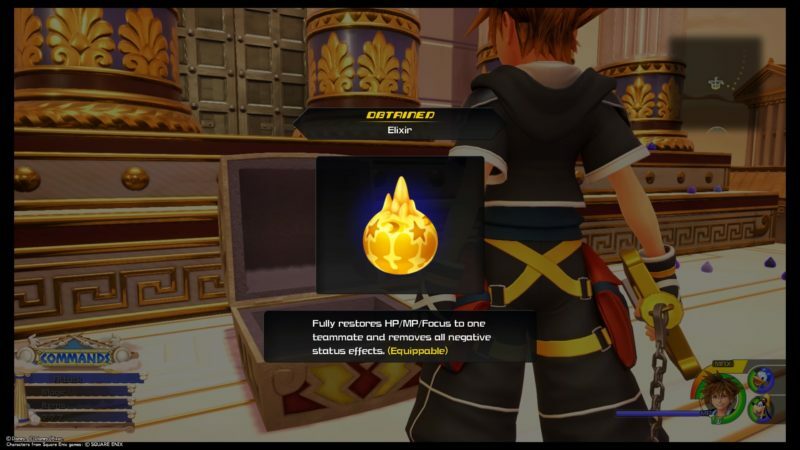 A chest will be revealed. You will get an elixir. You will finally reach the gates, but clearly the place is swarmed by titans. 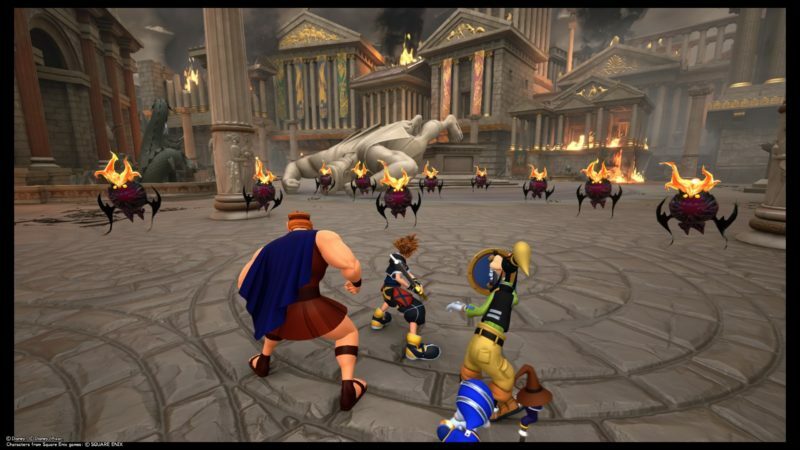 You will then have to face all three titans, as Zeus is trapped by Hades. Hercules joins you guys in the fight. For the first round, you need to beat these two titans first. 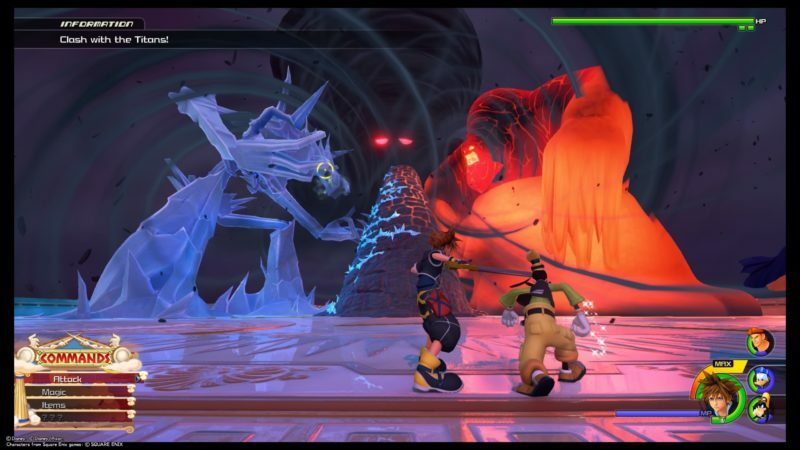 One uses ice attacks, the other uses fire (obviously). They are pretty painful, so you may want to avoid direct blows. Hydros uses a blizzard attack that damages twice (at least). Pyros uses more of a continuous flamethrower attack from its mouth. You can’t aim at their legs but only their faces. This means you need to use shotlock (to airstep) many times. 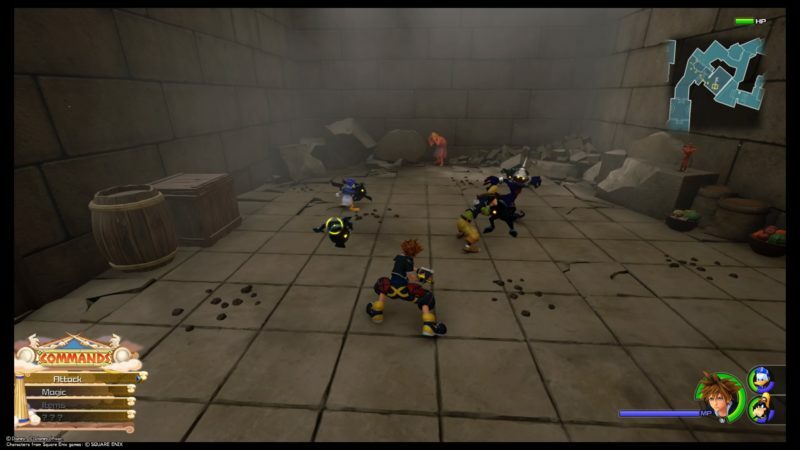 Hold R1 on their faces and press “Square” to airstep there. Keep hitting to stay on the air. 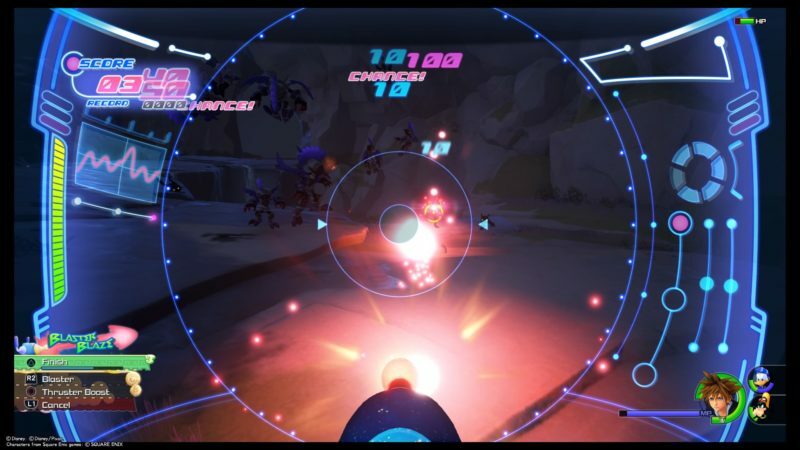 Another way to hit them is to use shotlock and press “X” for “Ragnarok”. It unleashes a barrel of magic attacks. 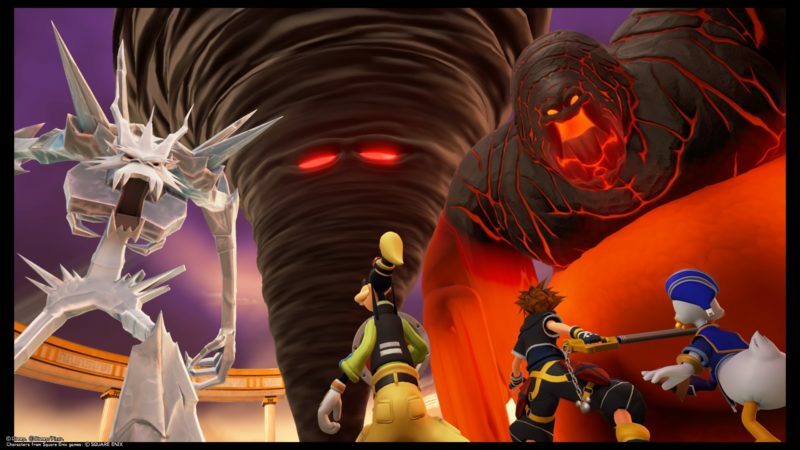 Once you’ve defeated the two of them, you need to face the Tornado Titan. This fight takes place on a different platform. When it’s not enraged, you can attack it at the base. See the yellow aim mark. This titan can throw all kinds of buildings and other objects at you guys. Try to dodge if possible. 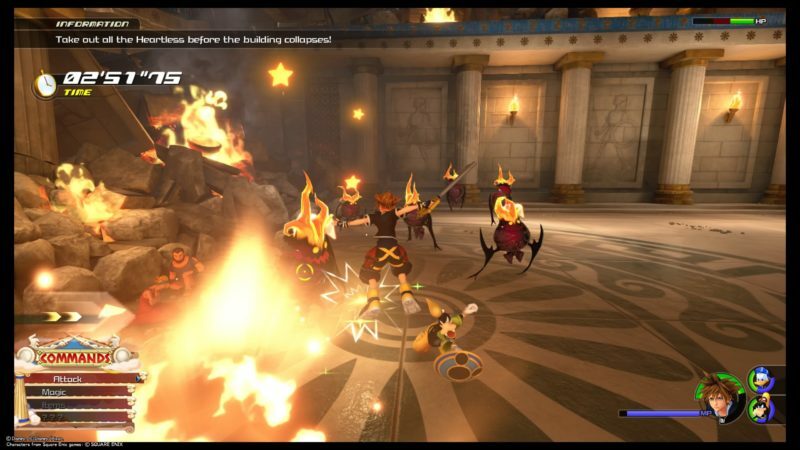 Another attack is that it throws you up in the air, and unleashes fireballs plus some objects towards you as you fall down. 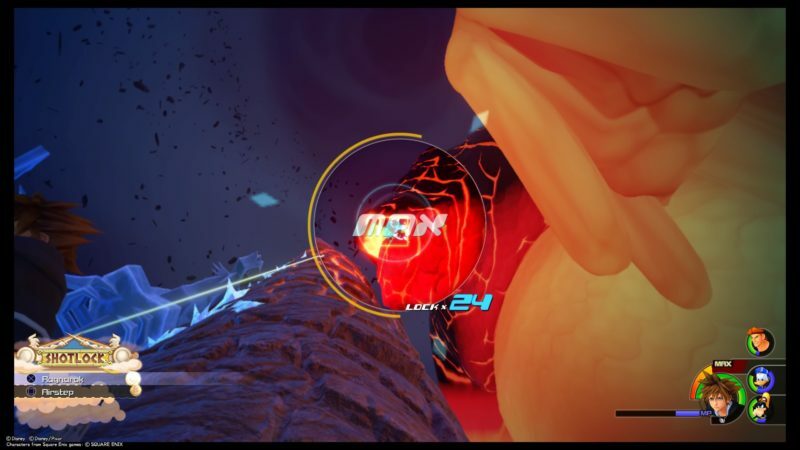 As you get lower, aim at its head and unleash your attacks. Keep repeating the moves and you should win the fight. Stratos has a much longer life (five bars of HP). 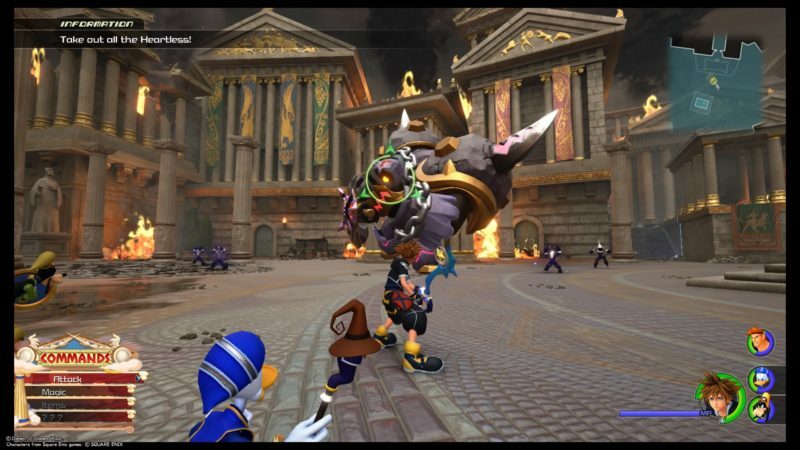 After defeating this titan, Hercules will release Zeus. 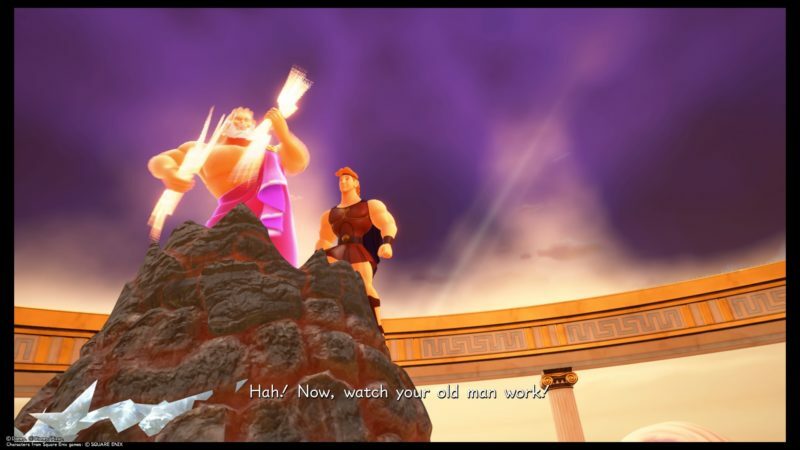 Hades will then be kicked out of Olympus yet again by Zeus and Hercules. 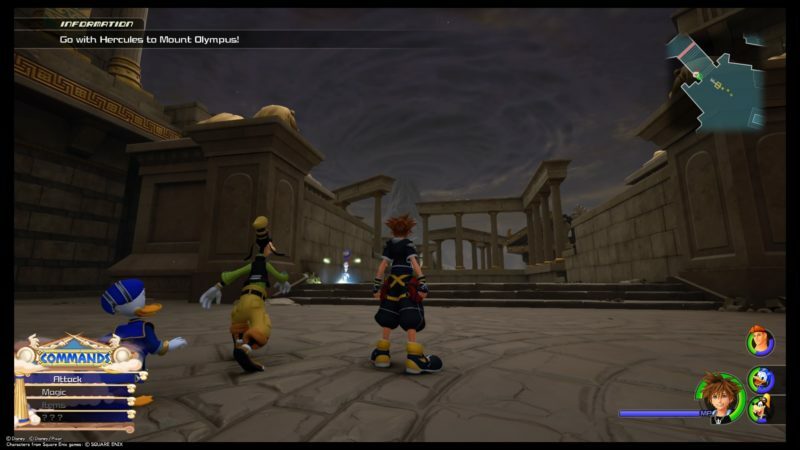 The story on Olympus is pretty much done for now. 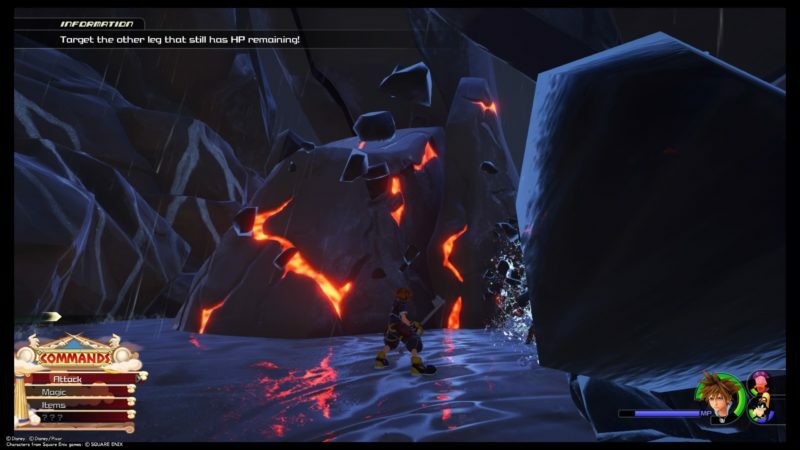 You will obtain a Hero’s Origin (new keyblade) upon completing this part. 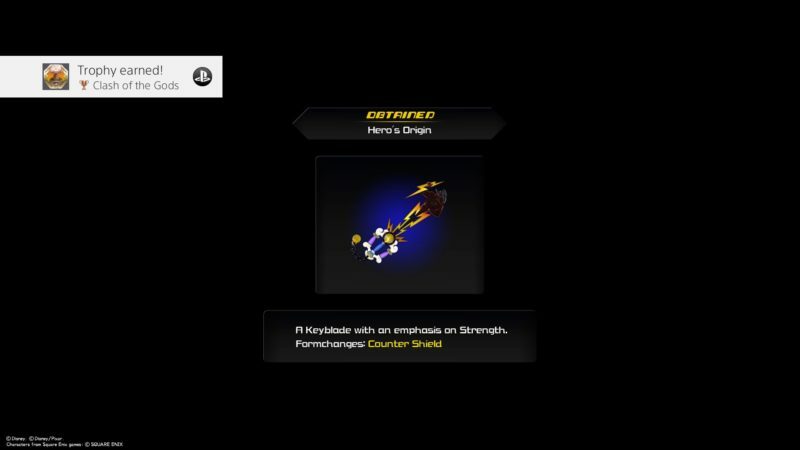 This keyblade emphasizes on strength. 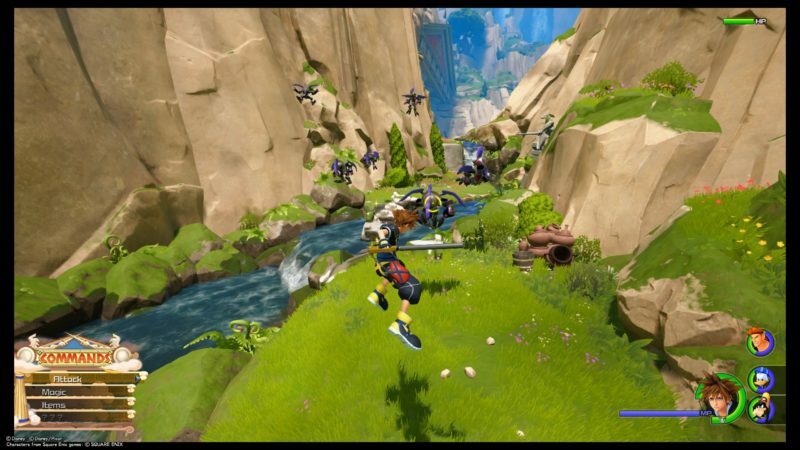 The formchange is a counter shield, which blocks (and absorb) damage when used. 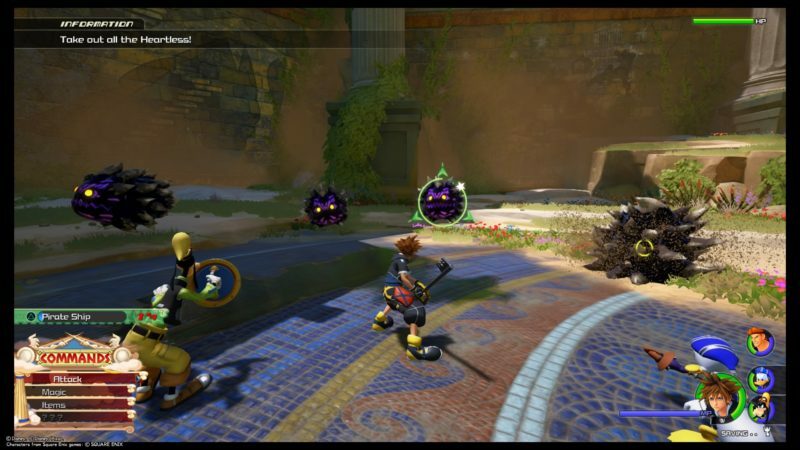 It will then unleash the attacks absorbed back at the enemies. 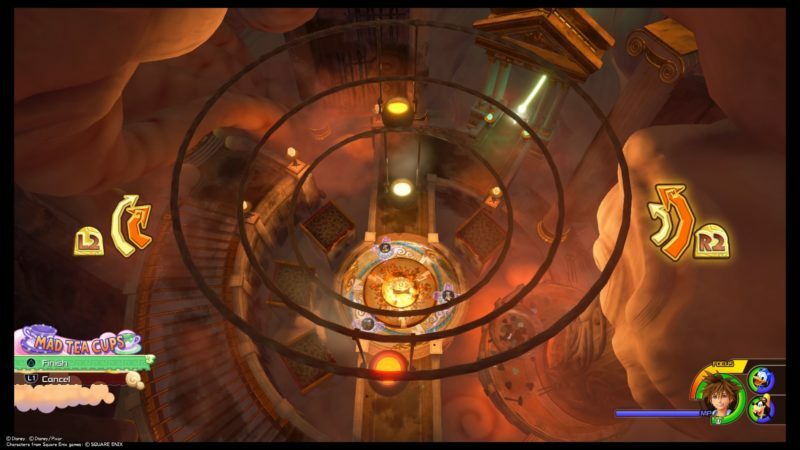 The walkthrough and guide for Olympus and Thebes ends here. Hopefully it was useful for you guys.